When I first read through this recipe I thought "I don't really get it, but I have a feeling it's going to be delicious." I mean, turmeric and beetroot? To me that was a questionable combination. But oh my god this bowl is so amazing. This is a slightly adapted version of Deliciously Ella's Spring Salad, I just tweaked it a bit to suit what we were craving. The rice and bean mixture provides a wholesome base that gives you a lot of sustenance without feeling heavy in your stomach, actually it tasted so good on its own that I had to keep "testing it for seasoning" before I'd even added the toppings. The dressing is so tangy and fresh that it makes you want to sing from the rooftops. You know, when something's so tangy it makes you want to sing.....No? The spicy, zesty flavour of the fresh ginger is totally balanced by the salty miso and bitter turmeric. And I love that the vibrant colour from the turmeric is basically the dressing giving you a heads up saying, "hey, I taste as bright and bold as I look." All the toppings bring something different, which means each carefully-constructed forkful has new flavours and textures. There's earthy beetroot, peppery rocket, creamy avocado or pops of sweet pomegranate. And the golden dressing enhances and intensifies the other ingredients; it makes the avocado creamier, the beetroot earthier and the rocket...pepperier? 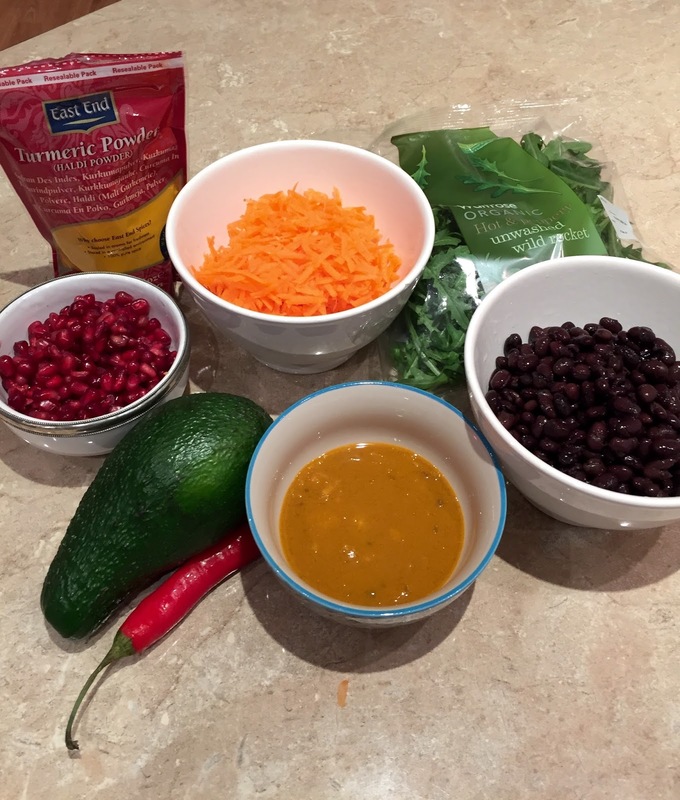 My favourite thing about the bowl trend is that you can strategically mix your ingredients in a different way each time you take a bite. Or you can attack it like some kind of madman and mix it all together – whatever floats your boat! 1. Cook rice according to packet instructions, when cooked and drained add the black beans and soy sauce. Leave mix to cool slightly. 2. In a small bowl mix together the grated ginger, miso paste, lemon juice, soy sauce and turmeric until combined. 3. Stir grated carrot and pomegranate into rice mixture. 4. Serve in 2 large bowls. 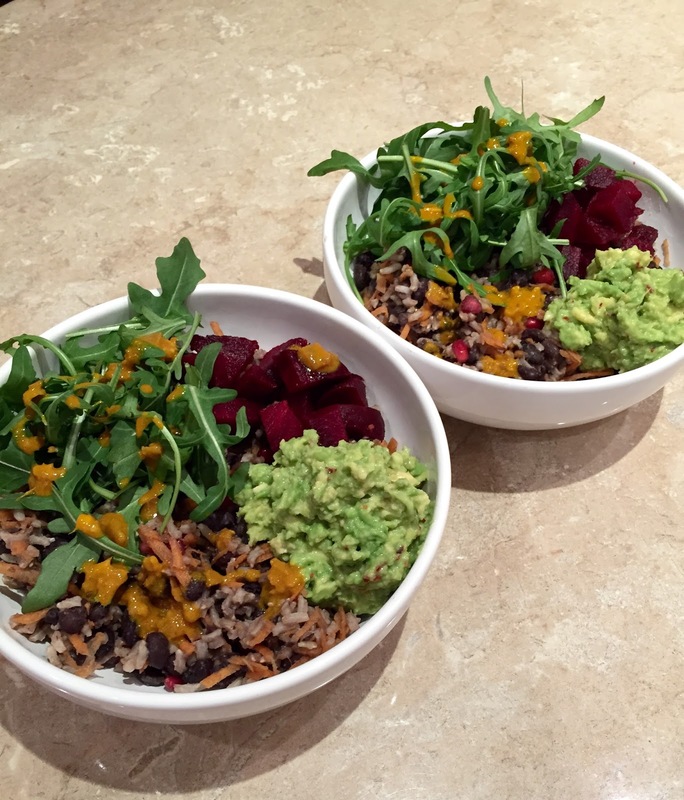 Top the rice mixture with the rocket, beetroot and mashed avocado then drizzle the dressing over the top. 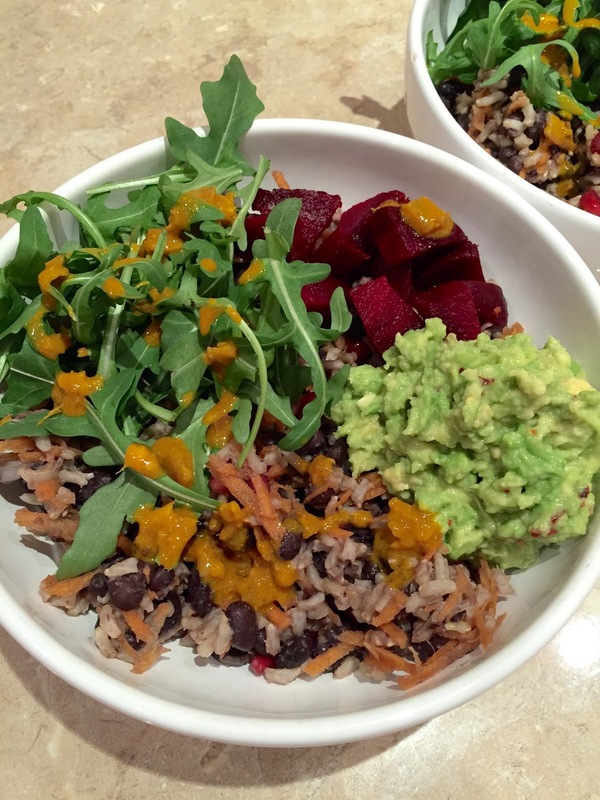 Have you tried any of Deliciously Ella's recipe's?